The Quarter Pounder with Cheese from McDonald's has a 4-oz. beef patty with two slices of cheese on a sesame-seed bun. If that's your sandwich of choice from the fast-food eatery, you should understand how it impacts your daily diet. 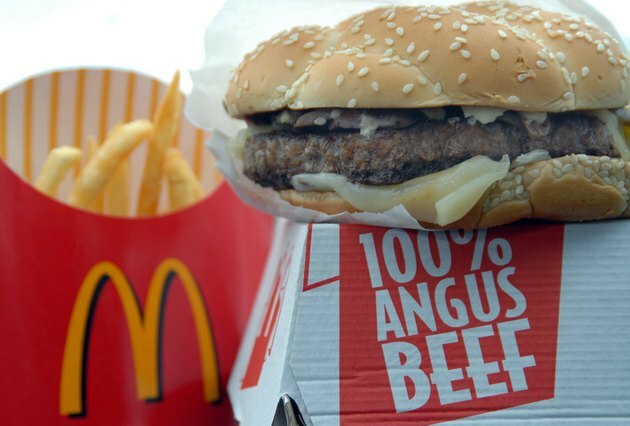 McDonald's Quarter Pounder with Cheese contains 510 calories, and 230 of those calories come from fat. If you eat 2,000 calories a day, the sandwich equals 25 percent of your total daily calories. Remember that nutritional values represent the burger only, and not any fries of soda you have with it. The Quarter Pounder with Cheese contains 26 g of total fat, or 40 percent of the maximum recommended intake if you eat a 2,000-calorie diet. The fat in the burger includes 12 g of saturated fat, 1.5 g of trans fat and 90 mg of cholesterol. The McDonald's Quarter Pounder with Cheese has 1,190 mg of sodium, equaling 50 percent of the maximum recommended daily intake. The U.S. Department of Agriculture advises people to restrict sodium consumption to 2,400 mg or less per day as higher intakes increase your risk for high blood pressure. The bun you eat with the burger contributes to its overall carbohydrate content, with the sandwich containing 40 g of total carbohydrates. The carbs include 3 g of dietary fiber and 9 g of sugars. The beef patty on the burger is a good source of dietary protein, with the entire sandwich adding 29 g of protein to your daily intake. The Quarter Pounder with Cheese contains a few essential vitamins and minerals. Each burger has 30 percent of the recommended daily intake for calcium, 25 percent of the recommended intake for iron, 10 percent of the recommended intake for vitamin A and 4 percent of the recommended intake for vitamin C.